Last week Godehard Kopp posted the video above of a Mimic Octopus, Thaumoctopus mimicus, and an un identifiable fish swimming amongst its arms at the divesite Jahir in the famous muck diving area of Lembeh Strait, Sulawesi Indonesia (the video of the octopus and fish starts at about. :44). Kopp followed the one octopus and fish for 15 minutes filming what appeared to be a previously unknown fish/octopus comensal relationship – a relationship in which one organism derives a benefit while the other is unaffected. Flurries of emails lit up the interwebs as fish and cephalopod and fish enthusiasts tried to determine what was actually going on in the video. Is this a commensal relationship or is something else going on? The colors of the fish were so matched to the arms of the octopus, that it could easily be thought that this fish must have a previously un-described commensal relationship with the octopus. On the other hand, there are small fishes that swim around foraging octopus arms in search of an easy meal, so it could be that this was simply taking advantage of a possible easy meal as the octopus made its way across the muck. On the third hand, these octopus have been photographed and filmed so much in this area of the world that it might be hard to believe that this behavior had never been seen before. Perhaps the fish happened to be in the wrong place and got scared as the Kopp moved to film in, and was trying to hide in the frist thing it found – the octopus. It was great to watch science in action in regards to this video. Observation, hypothesis, evidence, discussion, new hypothesis changing minds – science rules! 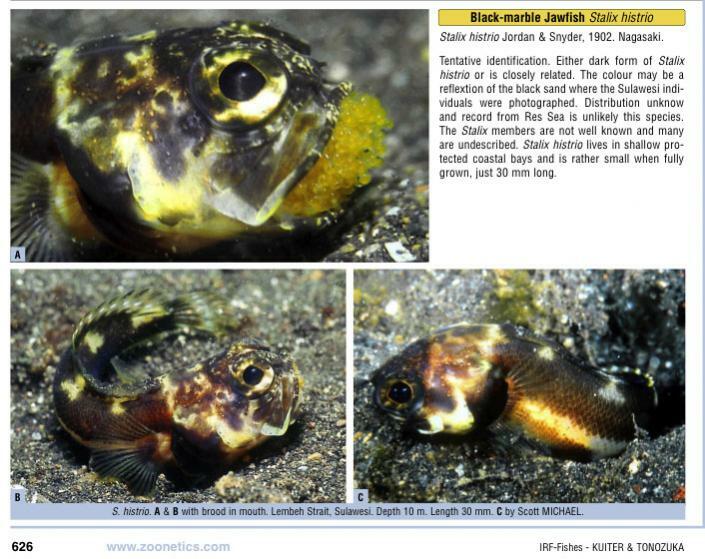 Indonesian Reef Fishes by Kuiter, R.H. & T. Tonozuka. (2001).